I’ve always wanted to write a post on Evernote. It was in fact my interview on Skitch for the Evernote blog that inspired teachingwithipad.org. While I can not boast to being a power-user of Evernote, I am finding more and more ways to use it to organize my life. Evernote is, in my opinion, one of the most useful and resourceful apps you will ever use. When you talk about Evernote, you’ll either meet people who a) could never live without Evernote, or b) have heard of it, and are somewhat confused by it and don’t really understand what it does. Evernote is definitely going to take a few weeks to commit to before becoming second nature for people. However, once the time is put in, you will realize the indispensable power of the features within the service. The more you add into your Evernote, the more incredibly useful and powerful it becomes. 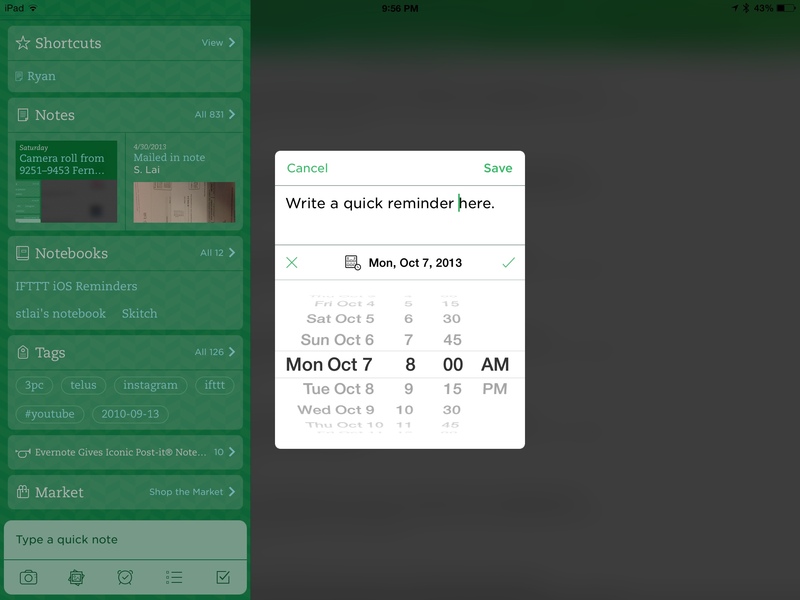 Evernote keeps your life organized. You can save anything to Evernote: thoughts, lists, websites, links, emails, mp3s. You name it. A lot has already been written about Evernote, and there is frankly too many awesome features to discuss. I will try to name just a few here, along with some great uses for Evernote in this post. As soon as the Evernote address appears, I add the @folder and #tags, tap it and send it. Within a few seconds, the email (and all its attachments) are filed into my Evernote. As your notes begin to grow, you can organize them into separate notebooks. If you’re not willing to do that, no problem. You’ll be able to search for any notes with the tag (#) feature. Keep them in one large notebook if you wish. Everyone loves flawless syncing between devices. Work a few hours on your PC, then continue to work on the road with your phone. Evernote will sync everything instantly so that you won’t lose any progress. All of your notes, links, photos are available on ALL of your desktop and mobile devices. While Evernote has a great web platform at evernote.com, you can do even more with its desktop client. It is a small download and works even better for longer notes. You can attach any file from your computer with ease. The desktop client also allows you to take full screenshots of your screen and drop them into your account. Once again, do your work on your PC while at work/home and take everything with you on your mobile device. The desktop version is lightning fast; your notes load incredibly easily. You can save tweets from Twitter directly to Evernote just by setting it up with @myen (my evernote). We know that Twitter is an incredible and vast amount of information. Save anything you are interested just by tweeting them to @myen. If you haven’t started using Evernote yet, now is the perfect time. The newly updated iOS 7 for Evernote looks great. It has been completely redesigned for even easier use. Make bulleted lists with a tap. Take a photo within the app and add quick notes to it. Create a checklist within seconds. Plan a list of your reading list for blogs/websites etc. Save and document student work by scanning into Evernote, organize by class/grade etc. The possibilities are limitless. With just the quick search functionality alone, this app is a must-have for people who wish to get organized, both with work and other facets of life. Evernote is NOT like Dropbox! Evernote has sometimes been confused as a “Dropbox competitor”. It most definitely is not. 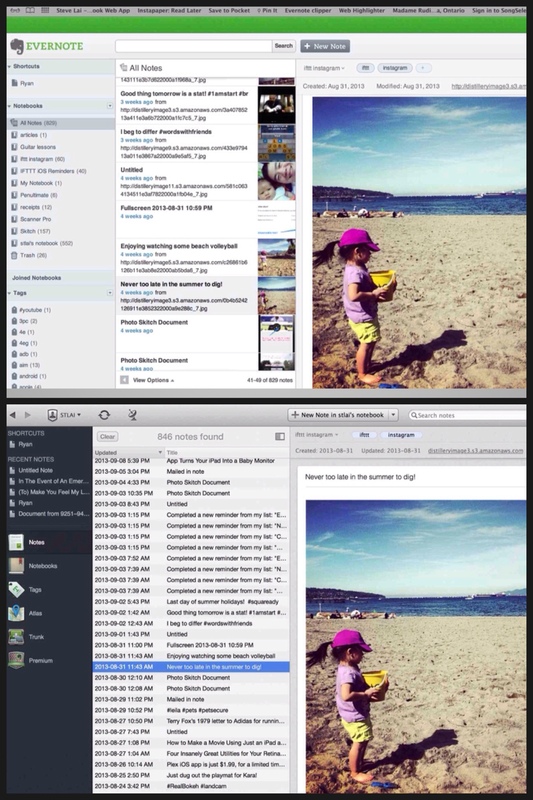 While Dropbox is a file storage and sharing service, Evernote is used more for quick notes and links and photos. It is more of a “working” file system, whereas Dropbox stores different file types for more permanent storage. Use Evernote for anything and everything you see on the web that interests you and for things you want to remember later. Use Dropbox to store all of your files that you use regularly, and to access your Powerpoint, Excel and Word files on the go. In its expansion, Evernote has purchased the apps Skitch and Penultimate, two apps that I use on a regular basis. Both apps also have added features if you go premium. Evernote has also recently made a deal with 3M to be able to scan (specific) post-it notes to become searchable text (a great way to bridge the old way with the new!). Give Evernote a try, get a month free of ALL its premium features by downloading it here. Teachers, check out this Evernote blog post on how to use it in everyday teaching. 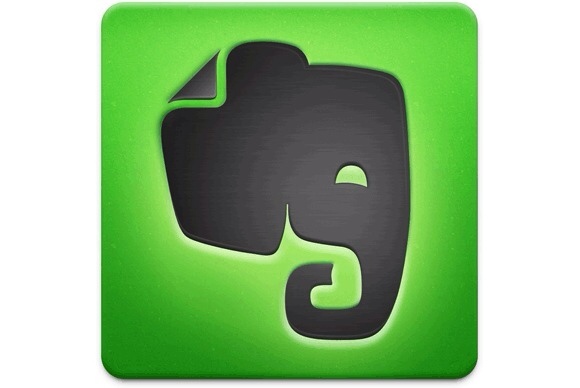 Are you an Evernote user? Do you have any tips/comments regarding this great app? Please let us know in the comments! We would love to hear from you! This is an impressive BLOG! 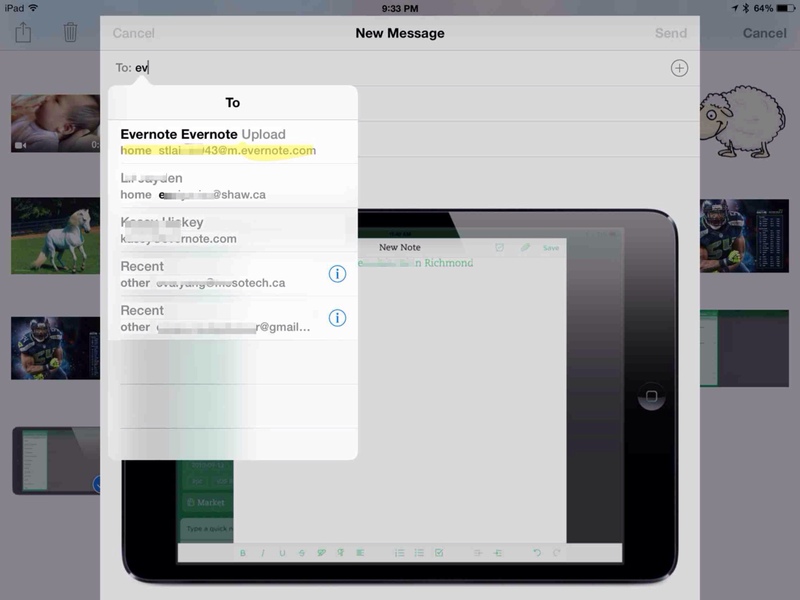 If you own an iPad and are an Evernote User, you should find this very useful. Thanks so much! Appreciate the reblog!